If the lack of time is the chief barrier to poor physician-patient communications, it logically follows that longer patient appointments are the solution. Ok, let’s say that I could wave a magic wand and add 5 or even 10 more minutes to the average primary care office visit. Would more time really make a difference? A physician’s communication style is a “window” into how they view the physician-patient relationship, e.g., physician-centered versus patient-centered. 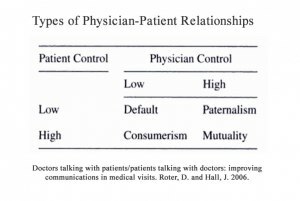 One landmark study of physician communication styles found that almost two-thirds of physicians (IM and FP) in the study had a physician-centered view of how physicians and patients should relate to one-another. While even the most physician-centered physician can incorporate elements of patient-centered communication in the medical interview process, the reality is that providers revert back to type. A provider with physician-centered directed orientation will still most likely interrupt the patient, not ask if the patient has questions and not use “teach-back” to make sure the patient understood what the physician said and so on. In addition to observable patient characteristics like age, gender, race and education, there is the person “behind the disease” who comes to the doctor with their own set of health beliefs, life experiences and treatment preferences. When the physician recommends a treatment that the patient does not believe will work, the likelihood of patient non-adherence is much greater than if the physician took the time to ask the patient their thoughts and collaborate with the patient on exploring the treatment that will work for both parties. Time is not the problem when it comes to improving physician-patient communications. I don’t really believe that additional reimbursement to physicians for sub-optimal patient communications is the answer either. Numerous studies have shown that patient-centered communication techniques in primary care practices can improve patient outcomes, change behavior and increase patient and provider satisfaction without increasing the length of the office visit. Steve Wilkins is a former hospital executive and consumer health behavior researcher who blogs at Mind The Gap.